The search and collection of martyrs’ remains is an important task and responsibility of the entire Party, military and people, profoundly demonstrating the nation’s traditions of “remembering the source when drinking water” and “gratitude”. In spite of obtained significant results, it is necessary to further enhance this work to meet the expectation of martyrs’ relatives and sentiment of the people nationwide. Over the past years, offices, units and localities have strictly grasped and implemented the 11th Politburo’s Directive 24-CT/TW, dated May 15th, 2013 on “Continuing to enhance the search and collection of martyrs’ remains until 2020 and beyond”, decisions by Prime Minister, and plans by the National Steering Board 1237 (on the search and collection of martyrs’ remains), thereby creating a sense of unity among organizations, sectors and people. The work of propagating and encouraging the provision of information on martyrs and graves of martyrs has been stepped up. As a result, organizations and individuals both at home and abroad have proactively provided information on martyrs and graves of martyrs, creating a drastic change in the search and collection of martyrs’ remains. The work of re-examining and completing martyrs’ profiles and the building of database of martyrs and graves of martyrs have been actively carried out and initially gained good results. International cooperation on this task continues to be expanded. Especially, cooperation on exchanging information and experience in searching dead or missing soldiers in wars has been included in working programs of leaders of the Party, the State and the Ministry of National Defence (MND) with relevant countries. 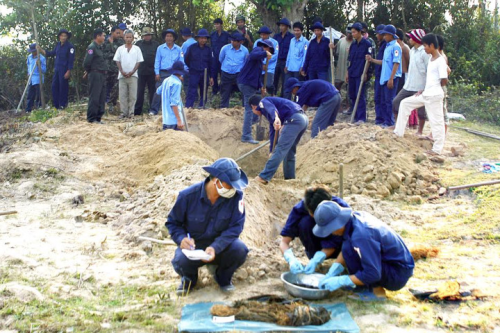 Military regions and localities sharing border with Laos and Cambodia have regularly cooperated with localities and people of these countries in the search and collection of martyr’s remains. 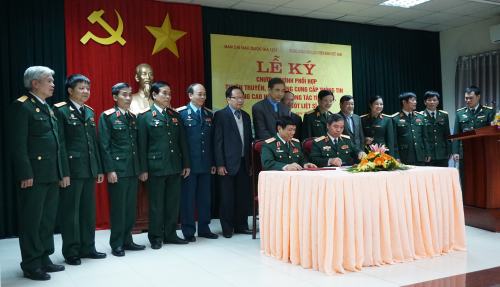 The building and repair of “Unity of Vietnam-Laos Combat Alliance” Monument and “Vietnam-Cambodia” Friendship Monument have contributed to propagating and confirming great contributions of Vietnamese Volunteer Soldiers and Specialists; to strengthening friendship, solidarity relationships between our Party, State, Military and nation and those countries. The work of carrying out inspection, preliminary review and review, drawing lessons, and ensuring policy, entitlements and facilities for the search and collection of martyrs’ remains has been executed sufficiently, opportunely. The search and collection of martyrs’ remains at home and in Laos and Cambodia has achieved important results. Many localities have proactively exploited and handled sources of information on martyrs and graves of martyrs, carried out various surveys, mobilized forces and means in this work on a large scale, and collected collective graves with many martyrs’ remains. Since 2013, 11,500 sets of martyr’s remains have been collected. The reception, handover and burial of martyrs’ remains have been organized closely, carefully, formally, expressing respect for and tribute to martyrs, contributing to propagating and educating all people, particularly young generations. Due attention has been paid to studying and building the procedure for identification of martyrs’ remains. Up to now, the MND has completed the phase 2 of the Project to upgrade the Center for genetic analysis (or DNA analysis), while actively analyzing and testing DNA of martyrs’ remains and martyrs’ relatives. In spite of positive results of the search and collection of martyrs’ remains, many martyrs’ remains have yet to be collected. The number of witnesses to graves of martyrs has increasingly decreased. The terrain has changed considerably due to socio-economic development and impacts by weather and climate, thereby causing difficulties for this work. Meanwhile, relatives of martyrs have been waiting for information of graves of martyrs for a long time. That has required the enhancement in the search and collection of martyrs’ remains in the current situation via practical guidelines and measures in accordance with the Project 1237, with a focus on the following. First, strengthening leadership and direction of the Steering Board 515 at all levels, local party committees and authorities as well as commanders of military offices and units. Over the past time, the Steering Boards on the search and collection of martyrs’ remains at all levels have always heightened their responsibility for helping the Government, ministries, sectors and localities step up this work. However, to meet the mission requirements, on May 10th, 2018, Prime Minister issued the Decision 515/QĐ-TTg on consolidating the National Steering Board for the search, collection and identification of martyrs’ remains (hereafter the National Steering Board or NSB for short) on the basis of merging the NSB 1237 on the search and collection of martyrs’ remains and the State Steering Board 150 on the identification of martyrs’ remains. Accordingly, authorities at all levels should quickly consolidate and improve the capabilities and effectiveness of the Steering Board on the search, collection and identification of martyrs’ remains, particularly the capabilities to counsel and propose measures, mechanisms and policies; heighten the role in directing and maintaining the collaboration between ministries, sectors and localities; enhance inspection and assessment of the work results to deal with arising issues, thereby ensuring the Project on the search and collection of martyrs’ remains achieve the stated goals. The MND and the Ministries of Labour – Invalids and Social Affairs, Foreign Affairs, and Information and Communications should closely cooperate with one another in fulfilling the assigned functions and tasks related to this work. Local party committees and authorities, and military offices and units should regard this as an important task of routine. They should continue to propagate and introduce the Politburo’s Directive 24 and basic contents of the Project on the search and collection of martyrs’ remains until 2020 and beyond to cadres, party members and people, thereby raising awareness and responsibility of organizations and forces, promoting their synergy in conducting this work. At the same time, due attention should be paid to ensuring policies and entitlements for families of martyrs; to assisting families of martyrs in visiting and moving graves of martyrs home; to receiving, handing over and burying martyrs’ remains closely, considerately and solemnly. Second, regularly stepping up the work of information and provision of information on martyrs and graves of martyrs. Especially, it is necessary to promote the role of organizations, forces and people both at home and abroad, particularly war veterans and liaison boards of units in actively detecting and providing information on martyrs and graves of martyrs as well as cooperating with competent agencies in searching and collecting martyrs’ remains. It is important to effectively exploit the results of decoding the numbers of military units as well as profiles, lists and database on martyrs and graves of martyrs to serve the search and collection of martyrs’ remains, particularly in the areas having collective graves of martyrs. Press agencies should intensify special pages and columns on this work in different times while the quality of the Program “Go searching graves of comrades” weekly telecast on VTV2 channel (National Television) and the Vietnam National Defence Television Channel should be improved to clearly demonstrate the goal and significance of the search, collection and identification of martyrs’ remains. At the same time, it is vital to digitalize information on graves of martyrs via application of information technology. This is not only a good deed by the Party, State and people but also a contribution to enhancing the effectiveness of management at all levels, creating favourable conditions for relatives of martyrs and people to access information on martyrs, graves of martyrs, and martyrs’ cemeteries quickly, accurately, thereby reducing difficulties in the martyr’s relatives’ process of looking for graves of martyrs. Third, successfully conducting the work of reviewing and completing profiles and lists of martyrs, designing maps for the search and collection, and setting up database of martyrs and graves of martyrs. In recent times, offices, units and localities have actively reviewed and completed profiles and lists of martyrs, classified the lists of martyrs according to their hometown and places where they died and were first buried, and then provided these lists for localities. The work of establishing database of martyrs and graves of martyrs has been actively carried out. Specifically, the Ministry of Information and Communications has directed the Institute for Software Industry to complete the Website and software to manage martyrs and graves of martyrs. The MND has transferred over 500,000 profiles of martyrs, the Ministry of Labour – Invalids and Social Affairs has transferred nearly 1,200,000 profiles of martyrs and more than 300,000 profiles and lists of graves of martyrs to competent agencies to serve the search, collection and identification of martyrs’ remains. Training courses on maps for the search and collection of martyrs’ remains at 3 levels (commune, district, and province) have initially gained good results as an important basis for the implementation nationwide. Military offices at all levels have heightened their role in cooperating with relevant sectors and organization in helping authorities at all levels identify and conclude information on the places where martyrs died and were first buried in the area; in making lists of graves of martyrs in the Martyrs’ Cemeteries; and in deciding the areas to create maps for the search and collection of martyrs’ remains. In setting up maps for the search and collection of martyrs’ remains at 3 levels nationwide, it is necessary to ensure sufficient contents, follow the procedure and reflect the results of the search and collection of martyrs’ remains. To do so, it is important to identify regions and areas having graves of martyrs which have been collected, or need to be collected, or have yet to be searched and collected, or have been searched without results, and the ones having Martyrs’ Cemeteries. In the coming time, functional offices of the MND should cooperated with other relevant ministries and sectors in soon completing the study of the procedure for identification of martyrs’ remains to be put into practice. Fourth, focusing all efforts on the search and collection of martyrs’ remains. Units and localities, particularly localities with many martyrs’ remains and graves of martyrs which have been provided with clear information, should develop plans for searching and collecting martyrs’ remains in their area in a specific, feasible fashion. From now to 2020, it is important to enhance the search and collection of martyrs’ remains in the areas all over the country and continue to cooperate with Laos and Cambodia in the search and collection of martyrs’ remains in these two countries until we no longer have information on graves of martyrs. During the process of implementation, the Government and the Steering Board 504 (the State Steering Board on the National Action Program on overcoming the consequences of post-war bombs and mines) should give priority to mine and bomb clearance in the areas with many martyrs’ remains to facilitate the search and collection of martyrs’ remains. Fifth, continuing to expand international cooperation on the search and collection of martyrs’ remains. Organizations and sectors should continue to encourage international cooperation to take advantage of support from governments, non-governmental organizations, and foreign organizations and individuals for information on dead or missing Vietnamese war soldiers as well as shared experience and financial aids in the search and collection of martyrs’ remains in Vietnam. In short term, it is necessary to discuss with China on measures to search and collect Vietnamese martyrs’ remains buried in Chinese land, especially along the border; to request for permission of Thailand to search and collect Vietnamese martyrs’ remains along the border between this country and Cambodia, and repatriate martyrs’ remains buried in Thailand; to request Azerbaijan’s permission to repatriate martyrs’ remains in this country. Moreover, it is important to closely cooperate with the Lao Government’s Special Working Commission, the Task Force of the Royal Government of Cambodia and their authorities in accelerating the search, collection and repatriation of remains of Vietnamese Volunteer Soldiers and Specialists died in Laos and Cambodia. With the deep gratitude to martyrs, a sense of unity of the entire political system, and the support of international friends, we will certainly successfully conduct the search and collection of martyrs’ remains, meeting the expectation of martyrs’ relatives, compatriots and soldiers nationwide, contributing to socio-political stability, defence and security consolidation, and national construction and protection.